I turn a whole rotisserie chicken into bones and five chocolate croissants into an empty bag. 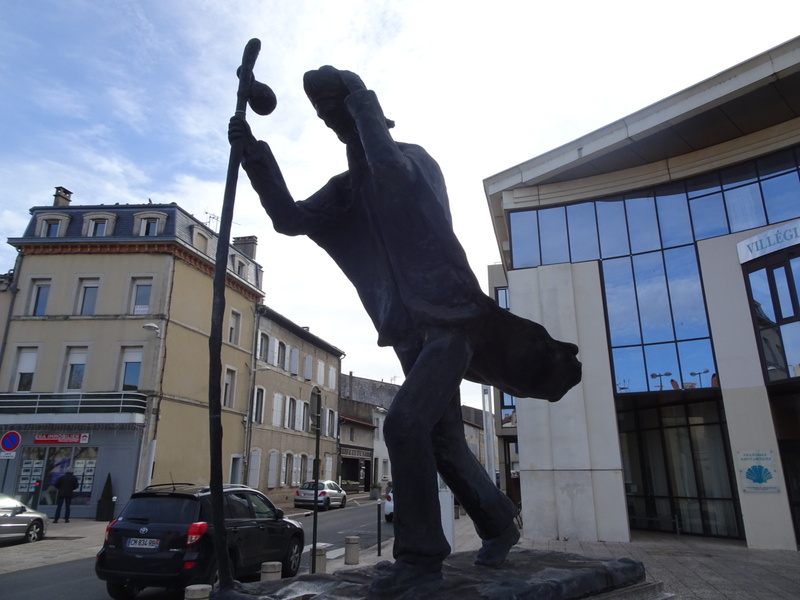 Then I walk out of Castres and into the flat lands stretching west toward Toulouse. I walk a patchwork, a bit along a busy highway, some small paved roads, dirt paths crossing farm fields, gravel strewn shoulders. Wherever the shells lead, I follow. I almost don’t need a map. Every day the trail seems better marked, every turn clearer. It’s simple, easy, and not what I came to do. I keep looking to the south, looking to see a hint of the Pyrenees in the distance. Nothing comes, not even the faintest line. I’m too far away. I don’t have to follow these shells. I could find a road, strike south, go until the snow-capped giants stand over me, then follow them west. It’s too deep in winter for me to walk their ridges, passes, and peaks, but I could still wander in their shadow. I look at my maps and think of the roads between me and them. So many highways. So many miles of narrow shoulders and cars roaring by. I think of drawing lines on maps back in Florida and how I didn’t hesitate to run my marker right over the empty space between trails and along the mountains. It’s so easy when it’s a map and your feet aren’t pounded into pulp on pavement. I follow the shells as they wander south and west. I follow them as night falls and I sneak off into an unused field to find a bit of flat ground. I stare at maps before I fall asleep, wondering which way I should go in the morning. This is the moment to turn if I want to. The shells head north and west toward Toulouse from here, away from the mountains until they dart across in a quick burst. This is as close as I’ll be to the Pyrenees for hundreds of miles. The roads. The mountains. Uncertain paths. Leaving the Camino after following it for days. Thoughts drift in and out as I fall asleep. I tell myself I will decide in the morning. I tell myself I don’t know which way to go. But I do know. I knew back when I drew a line on the map. As you well know, whatever road you chose will be the right one and new adventures await. Hooray! Yahoo!!! I was hoping you would go along the Pyrenees until you could cross! I know how much it doesn’t interest you to follow roads. Everything is an adventure, and maybe there are more chances for chocolate croissants and raspberry tarts and such along road systems, but, like the roads, they aren’t really what you came for are they?